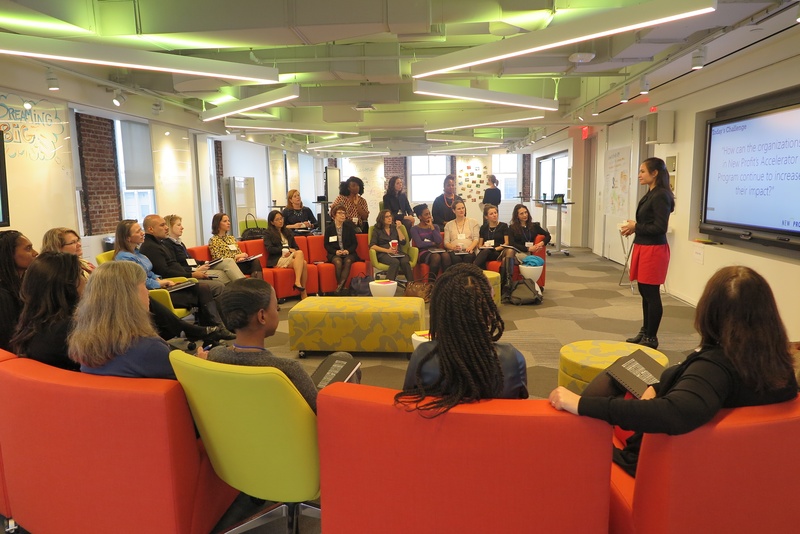 New Profit’s Accelerator is a one-year program designed to accelerate the potential of extraordinary female social entrepreneurs and the impact of their organizations. The inaugural cohort was made up of 7 amazing social entrepreneurs – Jessica Sager of All Our Kin, Alexandra Bernadotte of Beyond 12, T. Morgan Dixon and Vanessa Garrison of GirlTrek, Lisbeth Shepherd of Green City Force, Leila Janah of Sama Group, and Maisha Moses of The Young People’s Project. Over the past year, these seven female social entrepreneurs formed a cohort and received insider access to New Profit tools, resources, and networks in addition to a one-time gift of up to $50K. The group recently came together for the finale of the New Profit Accelerator pilot. The following post is an account of the event from Kelly Cutler, Associate Partner on the Portfolio Team, New Profit's Accelerator lead. On December 1st, on the anniversary of the day Rosa Parks helped to launch the Montgomery Bus Boycott, a group of extraordinary women leaders came together. On the 9th floor of the Cosmopolitan Club in New York City in a room backed by glittering skyscrapers, something spectacular happened. Women gathered. Strong, powerful, wise women. Warriors for equity and justice. Since New Profit had gathered these seven extraordinary female social entrepreneurs for the first time a year earlier, they had become like gears. Interlocking. Propelling each other forward. Earlier that day, the Accelerator social entrepreneurs were joined by their senior teams to experience a Greenhouse Lab hosted by our signature partner, Deloitte. Using outside-in inspiration from the natural world, the group identified their toughest business challenges and created possible paths forward to implement. They contemplated the adaptive nature of the cactus. They drew from the division of labor of penguins. They studied the diffuse leadership of starlings. They meditated on the strong and patient roots of the bamboo. Put aside fear to open up space for creativity. Speak the names of our forgotten brothers and sisters. Be real about race and gender.